Today we are stopping in with our weekly kitchen update. It will most likely be our last kitchen update for a few weeks, as we have done as much as we can until we receive our center island. Once that is in place, we can install our flooring, trim, backsplash and all of the really important finishing touches that will warm everything up! Although I feel like this process is moving slower than molasses, we really couldn't be more thrilled with where things are at and knowing that the end is near! 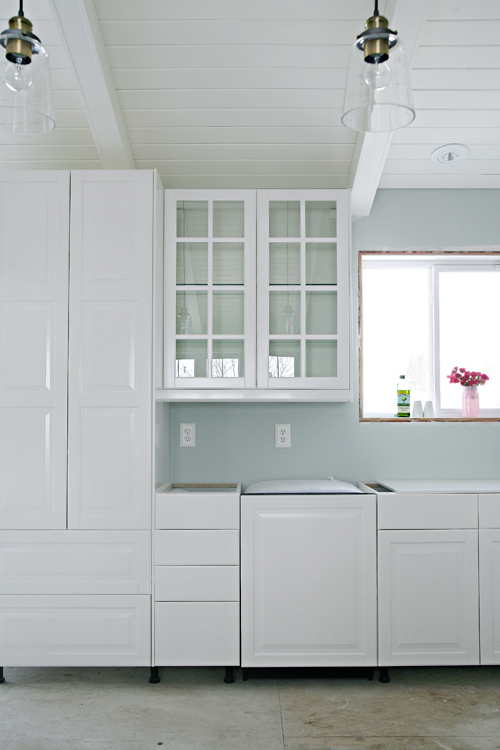 Last week we shared our experience installing IKEA kitchen cabinets. We have been living with them for over a week now, and although we are not using and abusing them the way we will once everything is loaded up and being used full time, we can honestly say that so far we are smitten. I have cleaned the faces a few times due to construction dust and some cooking grime and everything wipes up so nicely. The soft close function continues to fascinate us all, and we appreciate that we can easily tweak the cabinet hinges to ensure everything lines up and straightens out as things continue to settle in (as you can see above, we still have a few pieces to adjust). The biggest change we made this past week, was install the remaining cabinets on the far wall (where the beautiful aqua hutch use to live). Although I have a serious crush on that hutch (and may have a back-up plan for it down the road), the wall of cabinets allowed us to really maximize our storage. The cabinets are only 12" deep, while the hutch was much bulkier and wasn't able to secure tightly to the wall, so we also gain floor area. Plus, look at all of that storage; drawers and cabinets galore! Right now it is looking a smidge top heavy, but I have plans to make this little space a bit more custom. We took a quick trip back to IKEA this weekend to grab another rail to allow us to float the lower cabinets (they were installed in the same fashion as the uppers). Once the floors are installed, I plan to add decorative legs to the base cabinets to give them more of a furniture feeling (they will only be decorative, not intended to support the cabinets). The legs paired with a piece of counter cut to match the adjoining kitchen should really beef them up a bit. The lower cabinets will be fantastic for storing vases, entertaining decor, party supplies and outdoor dining items, while the uppers will display barware and serving dishes. 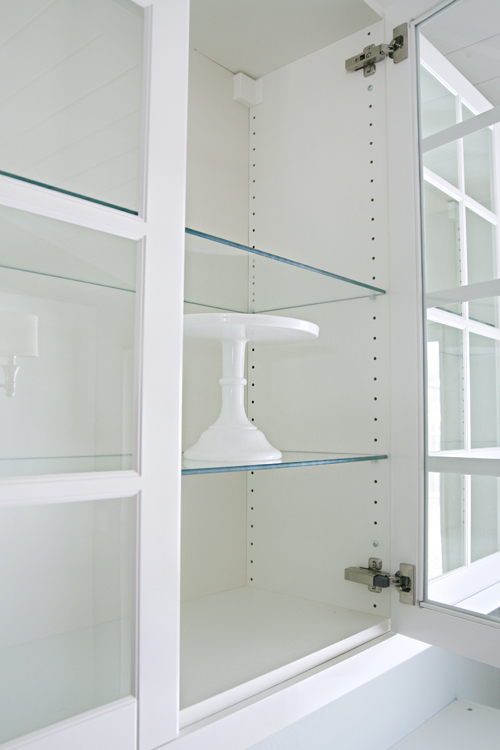 Another tip when it comes to these glass faced IKEA cabinets, is to order extra glass shelves. Each cabinet comes with two, however, visually you can streamline the display by placing a glass shelf behind each panel of the door. We are still waiting on the extra shelves to arrive. A wonderful reader let me know that IKEA now has plugs for all of those cabinet holes! Our IKEA has been sold out, but you can bet I am going to scoop boatloads! Thumb up IKEA! 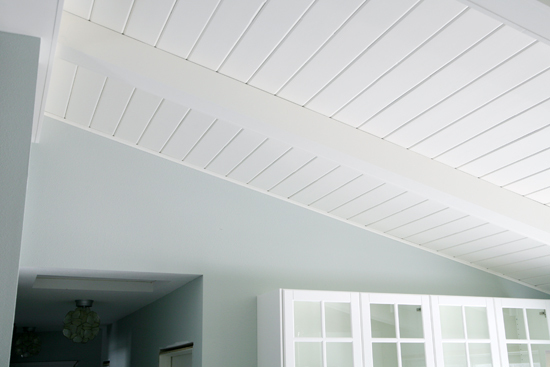 On each end of the kitchen/living area, we finally installed a small strip of decorative trim to really complete the look of the planked ceiling. We went with 12' strips of primed cove moulding, which I painted to match the ceiling color (Benjamin Moore's Simply White). They were installed with the brad nailer, and they really do finish things off nicely. 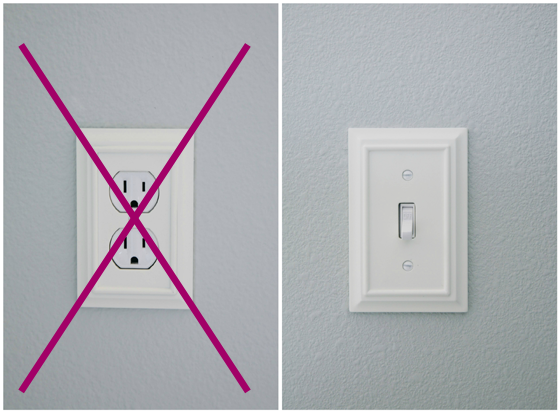 Another tip I received from a reader a few years ago, was to upgrade the outlet and light switch plates. Ours were previously an almond color, so we have been waiting for kitchen update day to swap everything out. 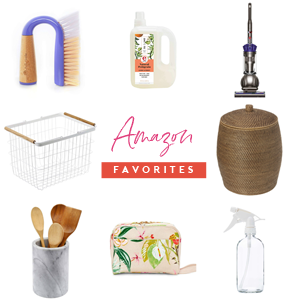 She recommend these from Amazon, and I have had them saved to my wish list ever since. I finally pulled the trigger, and I really love the decorative detailing they offer. They are white, however, not a brilliant white. They look great with the ceiling and IKEA cabinets, and even the switch looks OK, but the electrical outlet whites did not match and it totally bugs me. I plan on taking a cover to the home improvement store to try and find a closer match. My fingers are crossed tight that I find something because I really do heart the decorative plates. Here is the view looking at the new wall of cabinets paired with the tall, beautifully planked and beamed ceiling. I just sit and gaze at these ceilings for minutes at a time. They really are awe inducing. 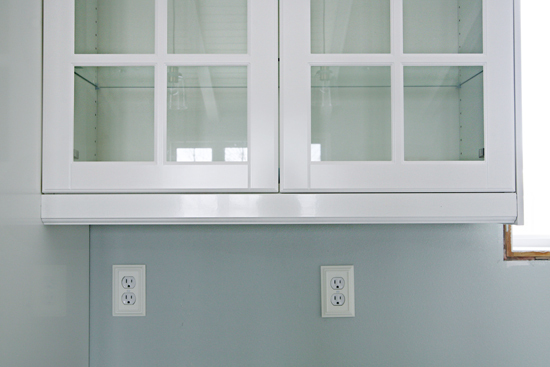 A few other finishing touches we added to the cabinets include more side panels and decorative moulding below the upper cabinets. 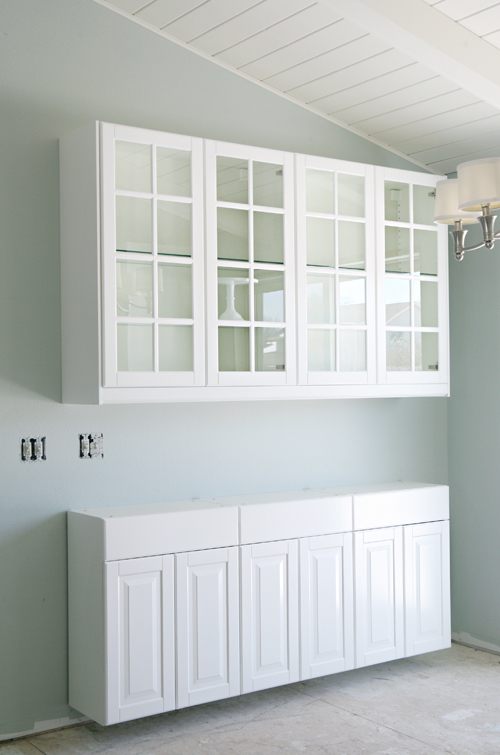 IKEA cabinets are simple white boxes which are then covered with panels to match the door styles. You can see above the panels are designed to go below the box of the cabinet, and decorative moulding finishes things off. These little details really did make a difference in the feeling of the cabinets as a whole. We are still waiting for one more cabinet to piece in next to the upper corner cabinet, and once that is installed, we can finish the panels and moulding below, and also add our own decorative moulding to all of the cabinet tops. In other kitchen news, I popped open a bottle of wine last night. I just had to celebrate the resolution of the dishwasher let down. Wait, what dishwasher? The one you would never know what there because it now has a decorative, integrated cabinet face! Woot! I shared a little about the dilemma last week, however, long story short is that IKEA no longer had their integrated model the day we finally put in our kitchen order. I kept the decorative panel piece just in case we were able to find another model that would work, but after a lot of searching, nothing fit our budget. So we purchased a standard dishwasher instead. During a recent trip to IKEA, I spotted integrated dishwashers with their new kitchen line. And they worked with the old line also! 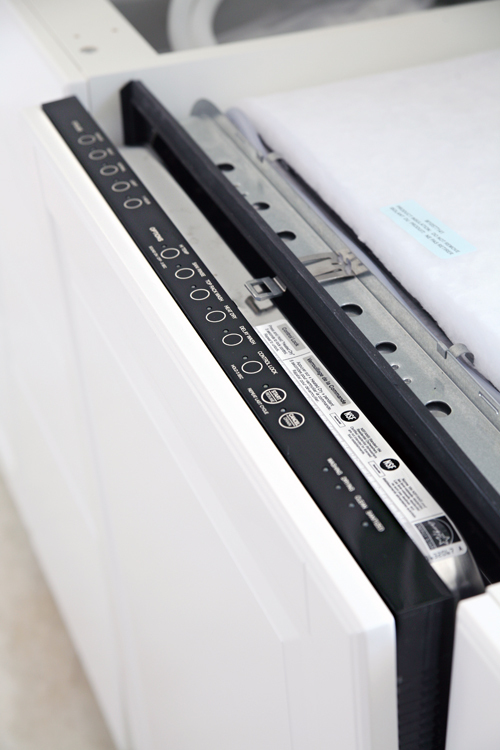 One dishwasher returned, one dishwasher purchased and I am glowing about this magical update! Our pendants arrived in the mail last week. I purchased a vintage chandelier on Craigslist for over the dining table (which my in-laws will be driving home from their place in Florida in a few weeks), so I had been searching for pendants that would sort of just fade away and let the chandelier become the star of the show. The chandelier has small bits of gold accents, which meant I also had to work with that during my search. 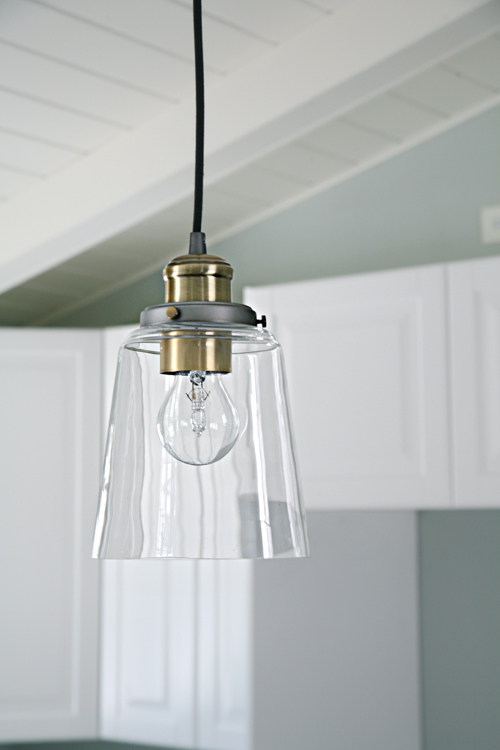 I ultimately selected and ordered these from Wayfair, I appreciated the simple glass shade, the price and the combo of nickel and brass accents. We used this advice from Houzz to determine the appropriate hanging height, as these will live above our center island. Overall, I really love them, but the wonky wire is really distracting my eyes. I have read that the weight of the light will eventually straighten the wires, so I am giving them some time. Otherwise, I may add rods to dress them up a bit. And that is where we are another week later. A few little details add up to a much more finished space. I am ready to start moving back in, but may be getting ahead of myself a bit. For now, I will just have to sit back, admire all of our hard work and play the hurry-up-and-wait game for the remaining pieces of the kitchen puzzle to arrive. Then we can get back at it! P.S. 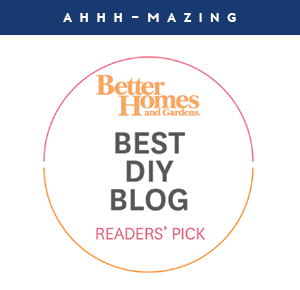 Thank you SO much for nominating iHeart Organizing for the Better Homes & Gardens DIY Blogger Award! You can cast your vote here throughout the next six weeks. Bryan and I are continuously grateful for all of your support! Smooches! Ha, thanks Jessica! And even without the island we already have more storage than we did pre-reno so we are definitely glowing! I can't wait for counters either, then we can really start using our kitchen again! Woot! It looks beautiful, so bright and cheery! Did I miss what is going on the floor? 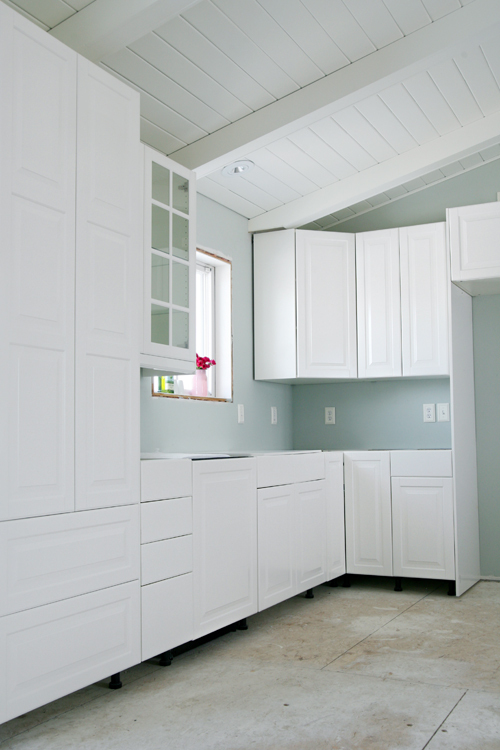 I painted my cabinets white this summer. Maybe someday we can do a complete upgrade, but IKEA is a good three hours away from me. Boo. The floors will be installed after the island is set, as the island/cabinets should not be installed on top of a floating floor to prevent the floor from shifting/buckling (we are going with a floating dark oak laminate). The floors will go up to the legs and then will be finished off with a cabinet toe kick to conceal things. Wondering what I can look for on the site to find the lower cabinets hutch u have? I can find any 12 inch depth and price? It's looking absolutely stunning! I'm not as much of a DIY person as you are, but your recent blog about someone cleaning out their pantry inspired me to dress mine, up, too! I'll have to blog about it once I'm done. Thanks for all of your inspiring stories! How did you determine the placement of the chandelier? I have great room and the chandelier that hangs over the informal "dining room" seems to be too close to the sliding glass door. It is also not in alignment with the ceiling fan in the "living room" area. I'm thinking to just swag it over until I come up with a permanent lighting solution in that area. BTW - the kitchen has recessed lights. Hi Leslie! Our chandelier is still placed right where it was when we built almost fourteen years ago. I believe our electrician at the time centered the sliding door and then also centered the dining area (minus our adjoining hallway). Lara, you should definitely paint your cabinets! We did ours, and our kitchen was so dark before. Now, it's much brighter. I will say, though, that it took WAY longer than I thought it would (like months), and my husband said he will NEVER do it again. So... if you're not real DIY go-getters, you may want to think about hiring it out. A friend of mine just got all her lower cabinets painted for about $600. The guys took off all the doors and sprayed them in their shop, and then came back and painted all the frames and rehung the doors. The whole process only took three days. Totally worth it! Of course, it would cost more for the whole kitchen, but I bet if you ask around and get quotes, you can find a good deal. Oh my word! 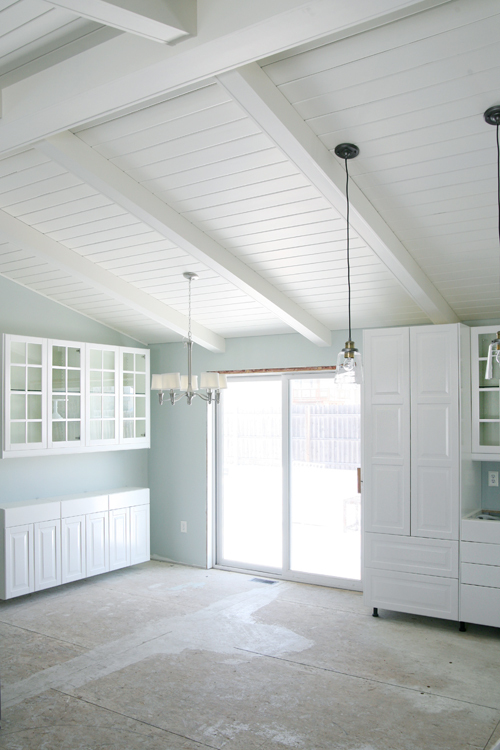 I love so many things about this space- especially the ceiling, glass paned cabinets, and lighting. What a bright, airy space! You've done a beautiful job! It's truly a beautiful space....and all of the little things totally MAKE it! Love the way you kitchen is turning out! Love all the white! Just a question out of curiosity, why didn't you lay your flooring down before putting in the cabinets? I have seen that done on shows on tv and am just curious, seeing you did not do that? Looking to replace my floor and wanting to know more about my options! Everything looks amazing!! You're doing a fabulous job! That looks stunning! I wish I was half as productive as you :3 Also, love the lamps, something about them that just grabs my attention. So what's the verdict on the paint on your walls? Have you fallen in love with it yet? It is definitely growing on me day after day. I think it will be really pretty when we start installing more of the soft finishes and the wood floors. xoxo! I love all of it (wall paint, lights, cabinets, ...) but I'm really admiring your glass front cabinets. So pretty! I hope to have these in our next house! Those and some open shelves would be in my dream kitchen. For your receptacles, check for Decora ones at Home Depot for sure. I would assume Lowes would likely have them as well. They are flat and you can get bright white, personally I like Decora over basic toggle switches and the receptacles. Loving your kitchen updates. Thank you so much for the suggestion Jackie! I will be sure to check them out! Also, as a designer, I highly recommend considering placing your outlets horizontally along the counter so as not to detract from your backsplash. Also thought you would like to see the "furniture leg" look of the base. Your kitchen is turning out beautifully. 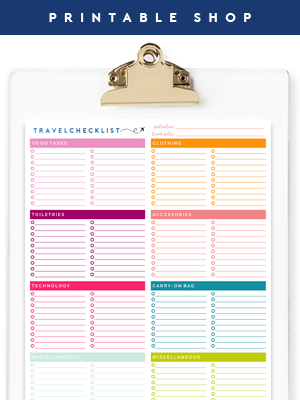 Long time reader and organization freak so excited to see where you end up! I have been watching this kitchen redo, and one thing I cannot fathom, is HOW do you get to do such a "clean" reno? I mean, even when ripping out everything, it still looked clean and dust free! Oh my! The DUST is everywhere! Seriously out of control. I have been vacuuming twice a day and dusting daily as well. We keep the doors to all of the bedrooms closed, but it really is dirty around here. And in the photo where I was painting the trim pieces... that is how the entire living room looks right now, filled with appliance boxes and tools. If anything, I am more excited about not having to deal with dirt and dust than I am having a stove to cook on. :) xoxo! I'm up in Alaska, and we did an IKEA kitchen remodel 3 years ago, and I LOVE it! We knocked down a wall too (like you, we DIY it all) so everything is nice and open now. We went w/the applad door fronts. And there is no IKEA up here, so we had to order/ship it up here on a barge & cross our fingers it all made it (which it did, but made things a bit tricky to change as we got going). Also, we have a pull out spice cabinet next to the oven and it is fabulous! I remember there was a little debate about them a few months back, but I do hope you went for it! Be-au-ti-ful! Coming together real nice and I'm over the moon excited about that new kitchen of yours! Great, great job! Wow it is looking fabulous. I love the cabinets, the ceiling is gorgeous and so is the colour on the walls. You must have the patience of a saint though, I'd just want it all finished now lol. Jen I can't stand how good it's looking and I have TOTAL dishwasher envy. I would love to make all of my appliances blend into my cabinets! I say go ahead and add rod to the lights now, I think it will give it a more high end look against all that white and pretty blue! I love your wall color. Most of the homes I'm working in now are featuring white and pale blue or gray with lots of glass. Spot on! My dream kitchen!!! !Love love love it!!!!! Wow, this is beautiful! I think I may have started drooling. There's some serious inspiration in this post!!! You rock! Jen what color did are the walls? I must have missed it when you posted about it. I'll go back and look too. Everything looks beautiful. I really love the lamps. I need something over my kitchen sink and something like that would be great. Thanks for being an inspiration. The walls are Benjamin Moore's Quiet Moments. You can read about the painting here: http://iheartorganizing.blogspot.com/2015/02/iheart-kitchen-reno-difference-week.html. xoxo! We have an almost identical space, but have been waffling over what to do with that wall in the dining room. I love your solution! We also haven't yet pulled the trigger on painting our cabinets. Yours is proof it's time to go for it! For the pendant cords..have you considered running your flat iron (on the lowest setting) over them, or hitting them with a steamer? Hi Rachel! I didn't try my flat iron but did give my blow dryer a try without much patience or luck. I think I am just going to dress them up a bit more with decorative rods. :) Best of luck with the cabinet painting! 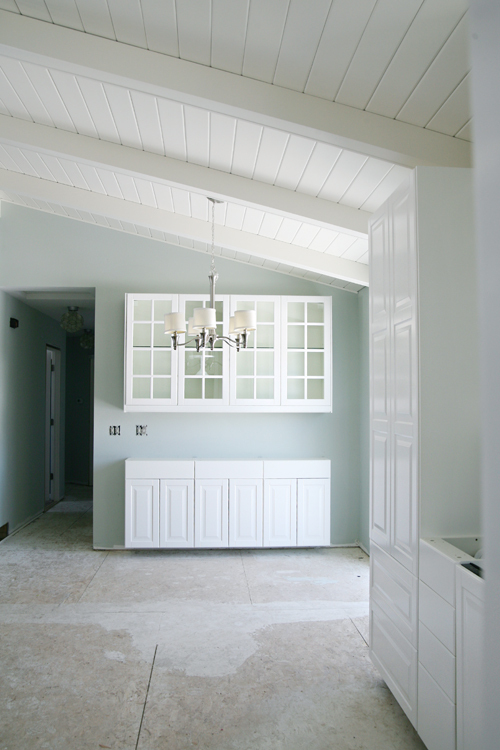 We lived with painted cabinets for years and were really happy with them. 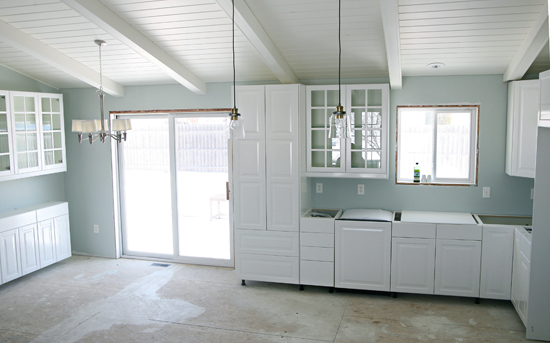 Hi Jen, Your kitchen looks absolutely beautiful even in its unfinished state! You have done so much and I love all your choices so far. We are getting ready to remodel our kitchen also using Ikea and I am a little scared about the planning process. 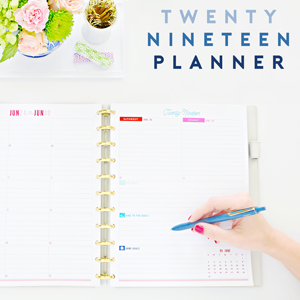 There are two companies that I have found so far that will do the planning for you and make sure you order every piece that you need. Did you use one of these services or did you do it all yourself? If you did it on your own, how did you go about knowing how many little accessory pieces you needed. I heard that part is a nightmare. The service costs $195 to design, work with you online by email (not on the phone - that coses $595! ), and make sure you have a complet order list. Thanks for any help you can give me. Really great question! IKEA has an online Kitchen Planning Tool right on their website, which you can use at home before heading into the store. We started by measuring and graphing out our kitchen on paper, accounting for structural and electrical placement of items we wanted to remain during the update. Then, in the IKEA planning tool, we started by adding walls and windows and piecing their cabinets together based on our measurements (overall the program is pretty user friendly and all of their kitchen products are integrated). Once we had a good idea of what we wanted from planning at home, we took our first trip to the store, loaded the plan in on their computers, and worked with one of their kitchen staff to make sure we had everything correct. 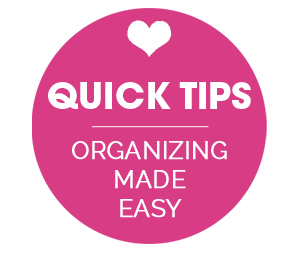 We were able to get a product list and price quote that very day based on the plans (which you can also see online at home), but went home to sleep on things and make sure everything was accounted for. When it was time to finally make the order, we had two IKEA kitchen staff members review our plans. They made sure we had enough panels, toe kicks, moulding, filler pieces, hinges, shelves, etc... Overall everything went really smoothly and we had everything we needed as we got started, with a few exceptions. The integrated dishwasher we wanted was no longer in stock, we had to go without until months later when a new one was released. A corner wine unit wasn't ever included in our final order, we are not sure why that happened, but were able to have it ordered and it has since been received. We opted to install the lower serving area cabinets on a rail (vs legs), that required us to go back and get that piece due to our decision. They misplaced a portion of our order, but when it was brought to their attention, they had it delivered directly to our home as soon as possible. We only live about an hour from IKEA, so that takes a little of the stress out of the process. Everyone has been helpful, knowledgeable and great to work with. The most stressful part was piecing things together and hoping that we were spot on with our own measurements, since that was all done at home by us. I'm really curious about the laminate floor. I never heard about putting a floor in "after" the cabinets, and as I'm debating if going the same route for our flooring I was wondering... How do you make it stop before the cabinets? Doesn't it "run away" if it's not "fixed" by the perimeter of the room? (Sorry for the absurd way of phrasing this, English is not my mother tongue :-) Will the flooring be installed between the feet of the base cabinets? Will you put a toe kick also around the island as well to conceal the the "meeting" of the two? Great questions! I am not 100% sure on the install, but I have been reading up on it as much as possible in home and DIY forums. There are types of floors that can be installed first, however, the type of floating laminate we selected may slightly expand and contract, therefore, we do not want the weight of cabinets, an island and all of our furniture, to prevent the natural movement and cause buckling. I believe the floors will be installed up to the legs below the cabinets, and then concealed with a toe-kick and moulding, same for the center island, decorative moulding and panels are added after the flooring. The floor will be installed under the appliances however. 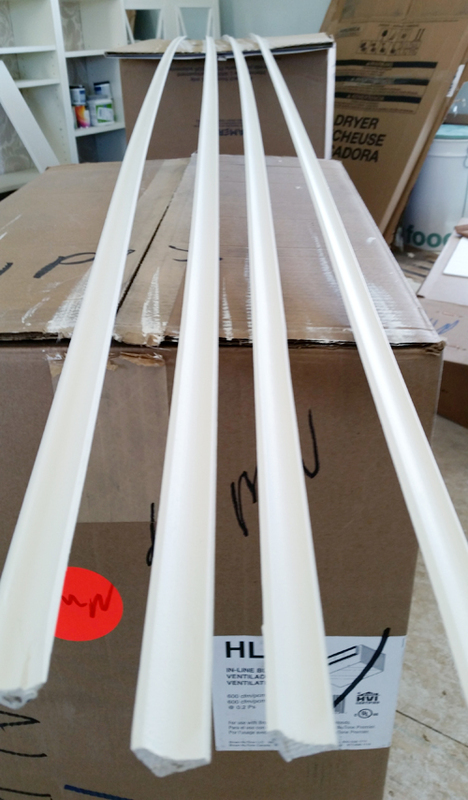 We will be sure to post specific details about the process when installation day comes around. :) xoxo! I forgot to subscribe to comments on my above post ( 2/29 6:29 pm) so that I don't miss your answer. Looking forward to what you have to say. I believe I am the random reader that suggested those switch plates on Amazon! I read your blog regularly but never comment. I will ask my husband where he got the receptacles and let you know! The kitchen reno is looking amazing, so exciting! Thank you so much for the recommendation Megan! We really do heart them! And I also love how much you sweet readers share with me as we work on our home. Smooches! Wow! This kitchen is like the kitchen of my dreams! 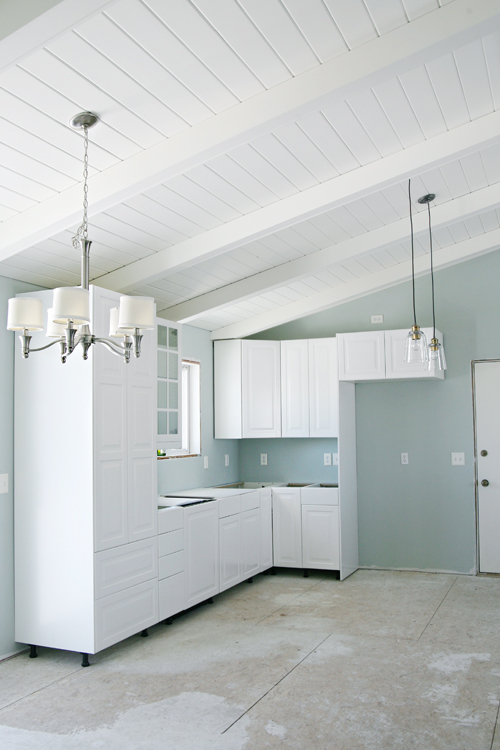 I love how the crisp white cabinets and ceiling vaults contrasts beautifully with the blue grey color of the walls. I'm really impressed by this renovation already. I can't wait to see the finished transformation! After doing a full gut and Ikea kitchen remodel at our house, it's so fun following along with your progress. So far, it's beautiful. I love it, it looks beautiful! So happy and excited for you. It is coming together so beautifully. You and Bryan have done an amazing job. And hey, if you can't find an outlet cover plate to match, let me know. Greg works for an electrical wholesaler in Mpls. and can search one down for you. Oh well your layout looks great! Wow, your kitchen is coming along so well. I especially loved the views of your ceiling in this post! It is stunning!! Those pendant lights are to die for!! I've been looking for some to put over our bar, and those are definitely my style! Oh my word! Jen your kitchen is turning out to be just beautiful. I love the wall color. Can't wait to see it complete!